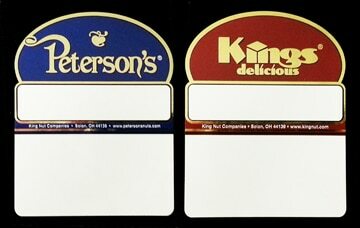 When looking for a way to have your label stand out from others, many people look into the option of Foil Stamping. I sat down with the Valley Forge Tape & Label Co., Inc. Vice President and General Manager, Dennis Hulton, to discuss Hotfoil printing as well as another alternative, Coldfoil transfer. The benefits and drawbacks of each were discussed and I have highlighted some of the main points in this blog. Hotfoil printing, often referred to as Hotstamping, has long been used as a label decoration method which imparts a look of richness, high quality and elegance to the product. It can be used as the solo graphics on the label or in conjunction with other color graphics. The process employs a very thin metallic coating supported by a thin plastic film carrier or liner. The metallic “foil” is typically bright silver or gold but it can also be colored to suit the application. An engraved rotary metal die or plate, typically brass, with the image area raised and the non image area recessed, is used to transfer the foil to the label substrate. The die is heated to approximately 325 degrees F. and as the label stock and foil pass between the heated die and a hard rubber nip roll under moderate pressure the foil transfers to the label in the image area only, leaving the non image foil on the carrier to be wound up as waste. A more recent development is the Coldfoil transfer process which utilizes a standard photopolymer printing plate to “print” an adhesive on the face of the label in what is to become the image area. The label stock and the coldfoil film are then nipped under light pressure between a hard rubber roll and an aluminum roll and immediately exposed to an ultraviolet light source which cures the adhesive bonding the foil to the image area only. Both processes allow for similar press speed, approx 100 to 150 feet per minute, which is relatively slow for typical flexographic printing. The cost of consumables such as the foil itself and the cost to power the heating of the die in hotstamping and the UV light source for coldstamping are comparable as well. The primary advantages of hotstamping are a very sharp, “crisp” image and the ability to print fine detail. The disadvantages are the cost of the engraved metal die, typically $1500 to $2500, and the lead time to make the die. The primary advantage of the coldfoil process is the relatively low cost of the printing plate, typically about $100. The disadvantages are a slightly irregular edge on the image and the inability to produce the fine detail of hotstamping. Depending on your product and your desired result, both processes are worthwhile to review. Valley Forge Tape & Label Co., Inc. has a page detailing our foil stamping capabilities as well as a Foil Stamping Questions tab where we are able to quickly answer any questions you may have regarding these processes. If you would like an estimate, please submit a Request for Quote and we will get a quote out to you within 24 business hours.